Metro transit is offering special MetroBus shuttle service for parade-goers and celebrants to safely and conveniently travel to Mardi Gras festivities and the 2016 Grand Parade in the Soulard neighborhood on Saturday, February 6. Metro will operate special Mardi Gras shuttle buses from 9 a.m. to 11 p.m. between Soulard and the Civic Center MetroLink Station which is located at the corner of Spruce Street and 14th Street in downtown St. Louis. The special shuttles will run every 15 minutes and will drop off and pick up passengers in Soulard on 10th Street between Carroll Street and Marion Street. Round-trip passes for the Mardi Gras shuttle are $6 and can only be purchased on Saturday, February 6, at the Civic Center MetroLink Station, starting at 9 a.m.
Metro will operate the special Mardi Gras shuttles every 15 minutes through 11 p.m. Regular Metro tickets and passes are not valid on the Mardi Gras MetroBus Shuttles. 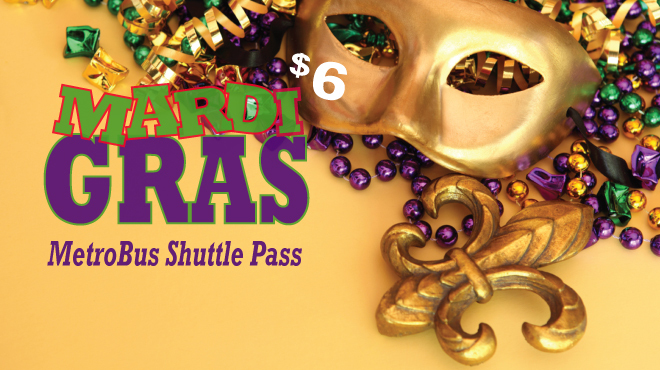 The Mardi Gras MetroBus Shuttle Pass cannot be used to ride MetroBus or MetroLink. MetroLink trains will operate every 20 minutes on the Red Line and Blue Line on Saturday, February 6, with trains arriving every 10 minutes at stations between the Forest Park-DeBaliviere and Fairview Heights MetroLink Stations. The MetroLink platforms will be monitored for crowds throughout the day and add extra MetroLink service will be added as needed. Mardi Gras celebrants can also get to the festivities in Soulard by via MetroBus. The #8 Bates-Morganford, #10 Gravois, #30 Soulard, #40 Broadway and #73 Carondelet MetroBus routes serve the Soulard area. Even though there will be detours in place on February 6, these routes will still get riders close to the celebration. Parade-goers and revelers are asked to leave their backpacks and coolers at home since they are not allowed at the Soulard Mardi Gras. No food, drink or alcohol is permitted on MetroLink, MetroBus, the Mardi Gras Shuttles or on Metro property. Due to Mardi Gras festivities and the 2016 Grand Parade taking place on February 6, the following MetroBus routes will be rerouted. Southbound: Regular route to Chouteau and Tucker, right on Tucker to Gravois, left on I-55 South, then exit and right on Arsenal and resume regular route. #40 Broadway — from 6 a.m. until 7 p.m.
Northbound: Regular route to Broadway and Arsenal, left on Arsenal, right on 13th, left onto I-55 North to Memorial Drive, left onto Walnut, then right on 4th and resume regular route. Southbound: Regular route to Broadway and Walnut, left on Walnut, right on Memorial Drive to I-55 South, exit and left on Arsenal, then right on Broadway and resume regular route. Southbound: Regular route to Chouteau and Tucker, right on Tucker to Gravois, left on I-55 South, exit and right on Gasconade, right on Broadway, left on Lemp, then left on Cherokee and resume regular route.